Today January 25th is the official PaperToy Monster Day!!! We are so happy to be apart of this great event! This year I wanted to find simple and low tech ways to have fun with my family. When I had the chance to review this book I knew this would be a great start. My sister and I both want to be more crafty and this book is a great way be crafty but also not leap right into handcrafting. I really liked the color and detail of the monsters. They were easy to punch out of the book and even easier when my husband suggested to tear out the whole page then the cut outs. I cracked up and had a duh moment when I realized that the whole page was intended to come out. My husband and I had so much fun making the monsters and handing them over to our son. He made a wild mess of them making them battle then crushing them. Even though he is too little to assemble them himself we all had so much fun. We look forward to making more monsters for him to play with and to share them with his cousins. For PaperToy Monster Day there are many fun activities you can do from home. There is a cool video to watch about making your PaperToy Monsters and the fun you can have! For Valentine's Day you can have your very own PaperToy Monster. It is really cute and would be great to give to your Valentine! You can download it here. If you want some PaperToy Monsters for your Super Bowl Party you can download two Football Ghouls. 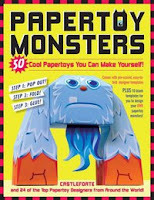 You can win your very own copy of PaperToy Monsters for your family to enjoy. MANDATORY Entry: "Like" PaperToy Monsters on Facebook. You can leave a comment that The Coupon Queen Bee sent you. Not required but everyone loves comments! *Limited to US residents; 18 years old and above. Giveaway starts January 25, 2011 and ends on February 5, 2011 at midnight PST. Winner will be emailed and has 48 hours to respond before another winner is selected. I was not paid for this giveaway or post. I was sent one copy of the book PaperToy Monsters for free for this review. Would love to win a copy of this. My son and I would have a ton of fun! Thanks for the giveaway! I took the quiz and I am RottonBottom! I like paper toy monsters on facebook. I like Paper Toy Monsters on Facebook! What a cool book!! !